The Cluster Pays mechanics has taken the online gaming industry by storm (Emoji Planet, Aloha Cluster Pays, Twin Spin Deluxe and more). 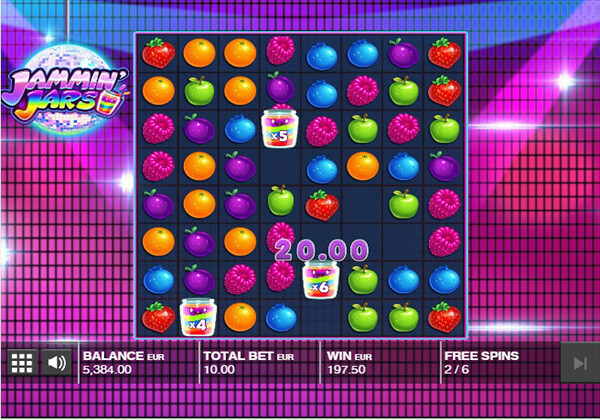 And Push Gaming is another developer that jumped on the bandwagon with their Jammin’ Jars slot. Their take on a fruit machine will provide you with an enjoyable gaming experience thanks to super cool visuals, a funky soundtrack and highly exciting bonus features that can help you hit some hefty wins. Using an 8×8 grid with no paylines, Jammin Jars slot machine pays as long as you create clusters of 5 and more matching symbols. While playing it, Jam Jar Wilds will help you create more winning combos and award multipliers that will increase as long as these symbols stay on the playing area. And they will stay as long as new combos are formed. Familiar yet refreshing, the Jammin’ Jars slot promises loads of entertainment and some serious prizes! No paylines. You don’t have to worry where symbols land as long as they appear in a sufficient number on adjacent positions. Wild Multipliers. Look out for Jam Jar symbols as they can do wonders to your bankroll. Cascading wins. Each win grants an additional chance of winning. Free spins. Triggering Jam Jar symbols will stay on the grid and move on each cascade or collapse with multipliers increasing by 1 whenever a cluster is created. Great winning potential. A maximum possible win in a single spin is staggering 20,000x your bet. Above the average RTP of 96.83%. Outstanding graphics and sounds. You will enjoy every second of playing it, we guarantee. Available on desktop, smartphones and tablets. Mediocre payouts. You can experience a winning streak with your bankroll decreasing, that’s what we talk about. Higher payouts start arriving when Wilds kick in, especially during free games. High volatility. Money management is all you need to master playing this game. While the Push Gaming 2018 release may seem attractive enough as soon as you load it, bonus features make all the difference. The Jam Jar symbol is key to winning big. Acting as Wild, it will complete your winning combos and whenever included in a win, it will move to an adjacent position with a multiplier increasing by 1 as long as it stays on the grid. Landing three or more Jam Jar symbols triggers free games. 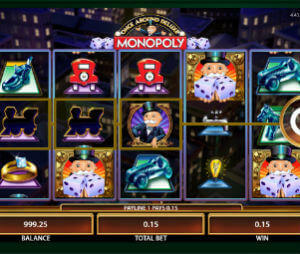 The number of free spins is determined at random. We have managed to trigger the feature with 6 free games awarded. Thanks to Wilds that remain on the grid and move from one position to another with multipliers increasing whenever a win is hit, we have collected a total payout of 44x our bet. Triggered at random after any non-winning spin, the Rainbow feature adds a giant symbol to the reels thus enhancing your chances to form a lucrative winning combo. An entertaining and rewarding title from the Push Gaming creative kitchen, we have to admit. What caught up by surprise most was a win worth 112x our total stake in the base game. We highly recommend giving Jammin’ Jars a try as soon as possible, but keep in mind that this is a slot machine of high volatility. If you are lucky enough, a huge win can come throughout the game.